Graffiti and mural art has been part of the revolution, drawings and paintings on the walls of Cairo streets has been expressing what people felt, what they were going through and what their dreams where all about. Even the protest signs were somehow considered as a mobile mural art or graffiti. Here’s a very interesting facebook page by the name of Revolution Graffiti that we found. 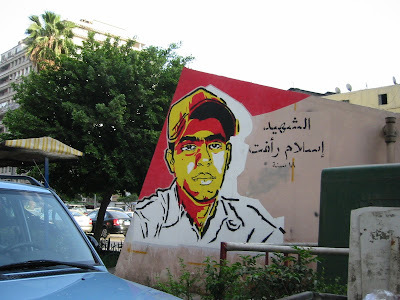 The page has lots of great artwork of graffiti and mural paintings from the street of Cairo (about the revolution of course). 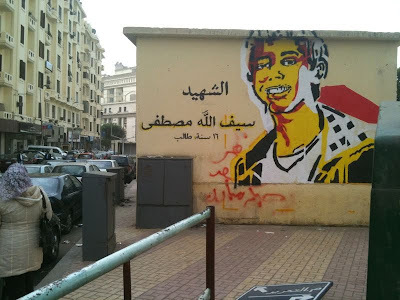 Also, Egyptian artist Ganzeer started a really great intiative, a project about mural paintings of the revolution’s martyrs. So far, only 2 have been completed with the help of Ahmed Nadim, Ahmed Eid, Lissie Jaquette, Henriette Heisse, Mustafa El Gamal, Ahmed Hussein, Rodina G, Noha Hesham, Hannah Cooper, Islam safi and others. And for twitter users, a hashtag has been created, #martyrmurals to follow the project’s updates. We used this definition to describe art in Mashareeb’s agenda (and we swear that our agenda is not a foreign one!). In moments like the ones we are witnessing right now in Egypt, people are experiencing a mixture of emotions and most of them are eager to express themselves in way or another. We have seen people taking pictures, shooting videos, making songs, writing poems, creating signs and they are most definitely putting a flavor to this revolution. Times like these witness the best work of creativity from people because it’s all about self expression, dreams, hopes and emotions. As Mashareeb supports Egyptian creativity, we wanted to gather as much as we can from the creative results of the 25th of January’s revolution (made by Egyptians and non-Egyptians) and present them to you. These posts are all dedicated to the lives of the protests’ martyrs. May your souls rest in peace. We’re finally back with our second revolution post! 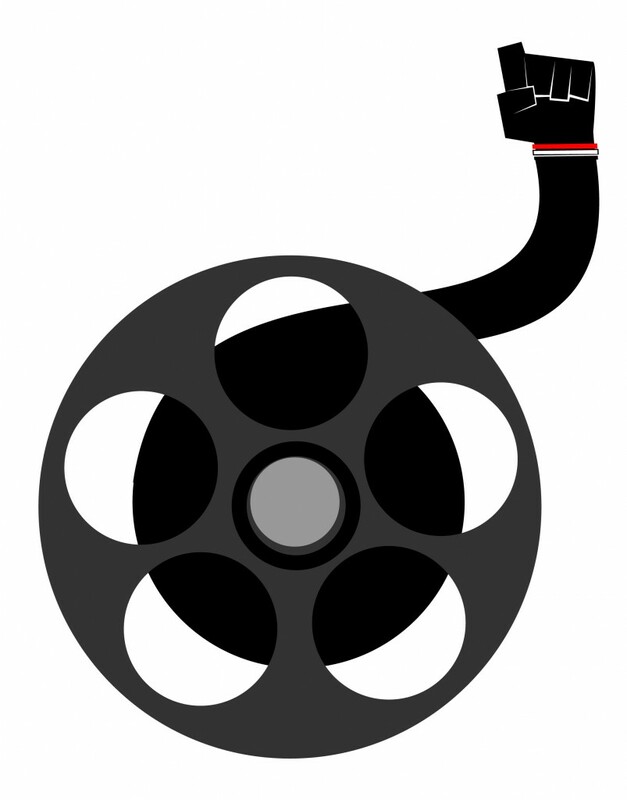 This time it’s about videos and animations done during the revolution or inspired by the revolution. Probably videos were the first art form to hit the internet concerning the 25th of January revoltuion (along side photography). Some videos were done by Egyptians while other were created by foreigners who got inspired by what they saw on tv. To be honest, the videos are numerous! So many to count and follow up with. We gathered the most famous, most touching, funniest and better produced ones for you. We really had a hard time finding out who actually made some of these videos, we did our best to write down the creator…as for the ones with no creators, if you know who made that video, don’t hesitate to contact us! We would love to give credit to the creators! Egyptian Revolution Jan 25th the story – Take What’s Yours! “Art is the process or product of deliberately arranging elements in a way to affect the senses or emotions.” We used this definition to describe art in Mashareeb’s agenda (and we swear that our agenda is not a foreign one!). In moments like the ones we are witnessing right now in Egypt, people are experiencing a mixture of emotions and most of them are eager to express themselves in way or another. We have seen people taking pictures, shooting videos, making songs, writing poems, creating signs and they are most definitely putting a flavor to this revolution. Times like these witness the best work of creativity from people because it’s all about self expression, dreams, hopes and emotions. As Mashareeb supports Egyptian creativity, we wanted to gather as much as we can from the creative results of the 25th of January’s revolution (made by Egyptians and non-Egyptians) and present them to you. 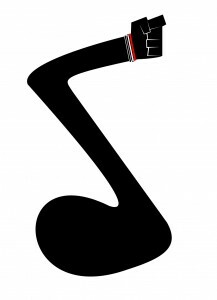 Our first post from the revolution art posts will be dedicated to the music inspired by the revolution. Egyptian musicians have all been inspired by the current events and some of them have actually been an inspiration for the revolution. The inspiration did not stop here in Egypt, people from all over the world contributed and dedicated songs to the revolution and the Egyptian people. We tried to gather as much as we can all the songs that has been surfacing the internet talking about the revolution. If you think we missed some, please don’t hesitate to send us whatever you have.